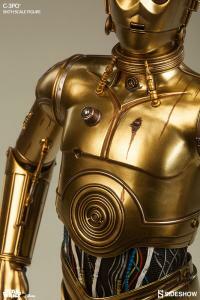 I am C-3PO, human-cyborg relations. 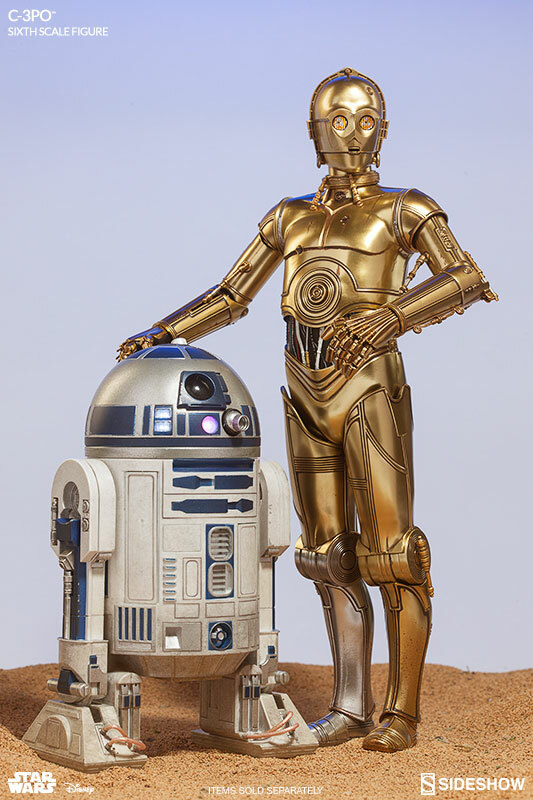 A long time ago, in a galaxy far, far away, two unforgettable droids captured the imagination of moviegoers around the world... Now, joining his feisty astromech companion R2-D2, Sideshow Collectibles is proud to present the C-3PO Sixth Scale Figure Star Wars collectible. 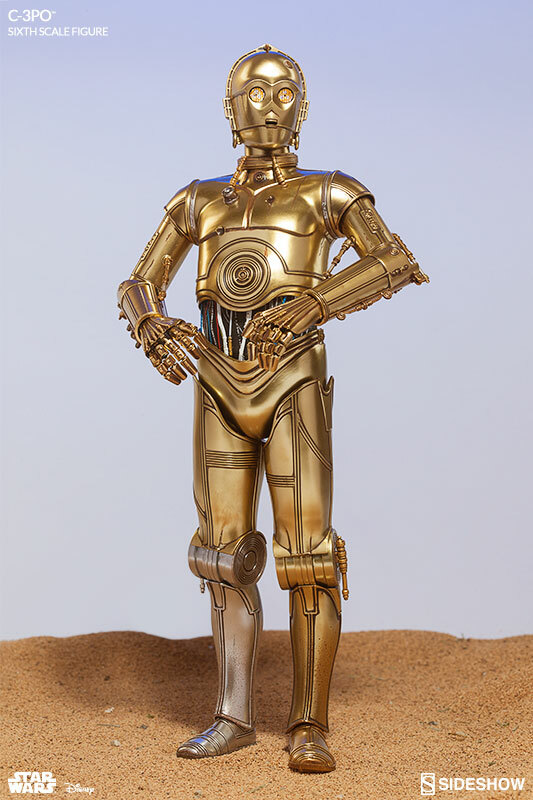 Weathered from time spent stranded on the desert planet of Tatooine, C-3PO is ready for adventure with the Rebel Alliance alongside Luke, Han, and Obi-Wan Kenobi. Built with screen-accurate mechanical detailing and light up features, Threepios advanced articulation and poseability allow collectors to perfectly capture the nuances of his quirky personality. 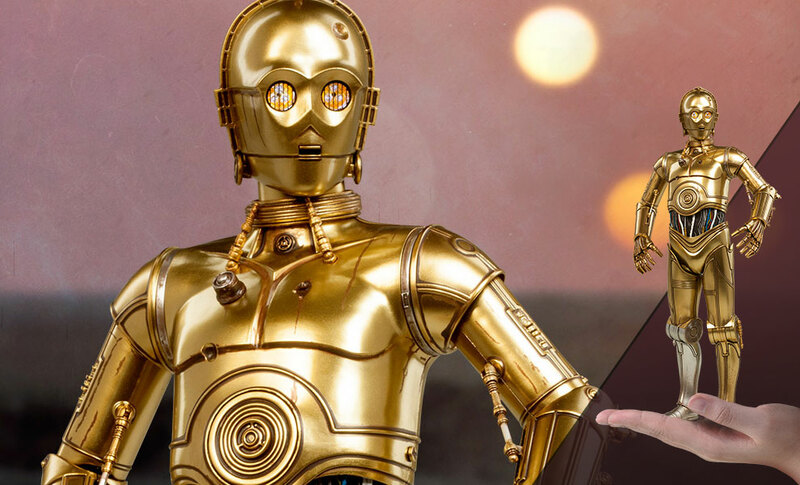 Equipped with a comlink to receive instructions on his next mission, take command of the protocol droid with an attachable magnetic restraining bolt. 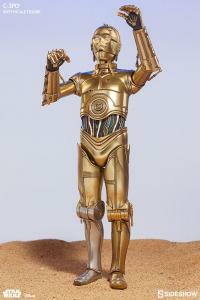 An essential addition to any Star Wars collection, this is the droid youve been looking for. Thank you, Sideshow! What a fantastic piece and an excellent companion for the deluxe R2-D2 I picked up last year! The level of detail is amazing and impressive. Don't wait too long, this bad boy is nearly sold out! This time, Goldenrod is telling you to hurry up! Look a Transport! Over here!! Nice addition to my Star Wars line up. Great detail and articulation. Best touch is the light up eyes with just a tap. Shame the other 1/6 figures arent as easy to use. Make it easier Hot Toys!! This figure is amazing. 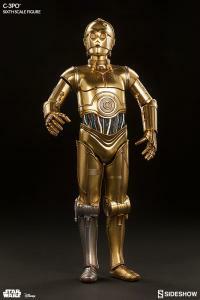 It really captures the likeness of C3po and the light up feature and articulation are excellent. My second order from Sideshow, and again, there is no disappointment. Such a great piece! 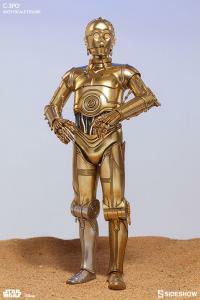 One of the most iconic figures in pop culture, and hes a great addition alongside my R2-D2 Deluxe Sixth Scale Figure. Great job you guys, and please keep up the amazing work! Thank you, Sideshow! 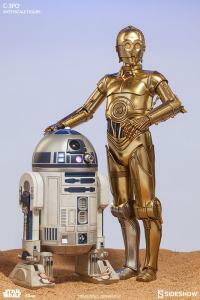 What a fantastic piece and an excellent companion for the deluxe R2-D2 I picked up last year! The level of detail is amazing and impressive. Dont wait too long, this bad boy is nearly sold out! This time, Goldenrod is telling you to hurry up! This is an awesome piece. The paint work, the durability,the lights, the movements are spot on perfect! 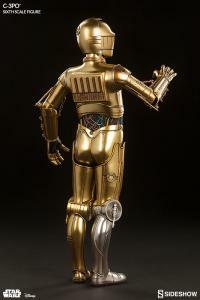 Mr. Anthony Daniels would agree, this piece is " A MUST HAVE"
In 1977 Star Wars hit the movie screens! 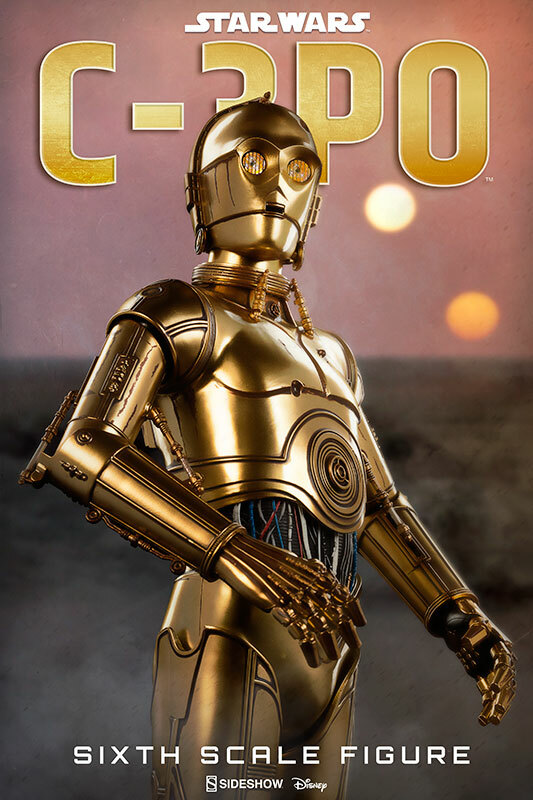 I was 19 years old and in this movie a funny gold plated British accent droid was one of the catalyst that made this movie so iconic. 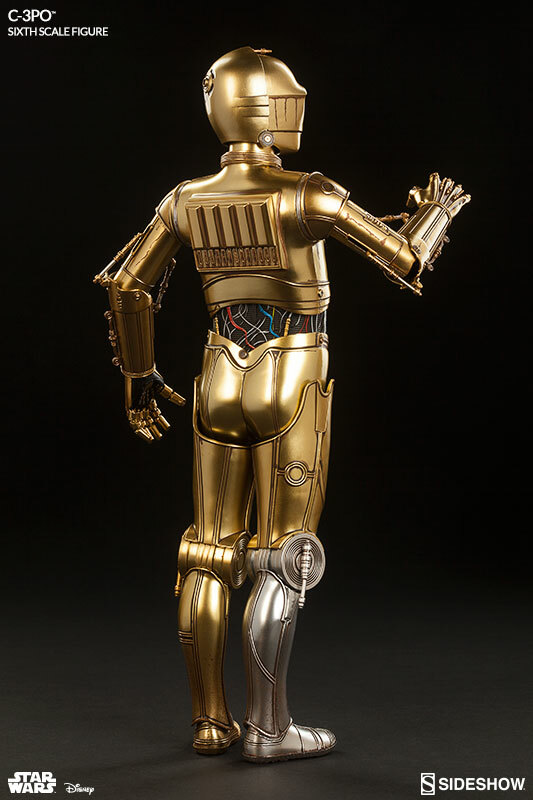 Sideshow has made a great figure of this beautiful droid! Really nice item mine came with a broken arm, but when I contacted Sideshow about it, it was replaced quickly. 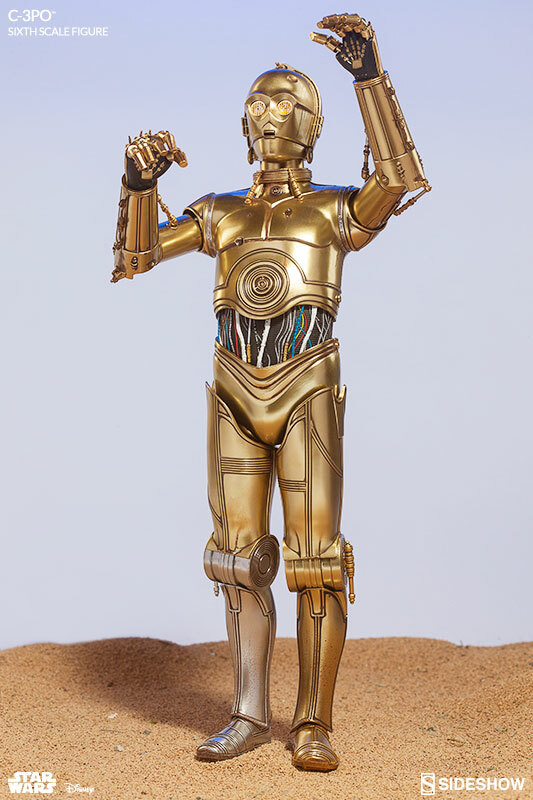 So excited to get a 1/6 weathered C-3PO from ANH, and it arrived and overall didn't disappoint. Thumbs issue was not cool (put on at a strange angle in fin. product run, I double checked vs. prototype and film stills) and box came dented, but even still, a favorite and a keeper! Well done! WoW! Outstanding c3po Love him a Ton of Presence on the shelf. A must have in the collection thank you Sideshow a home run release. 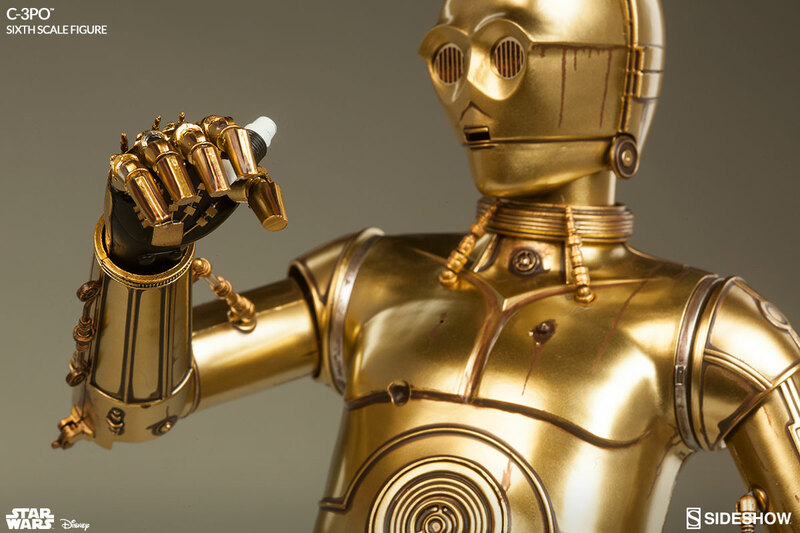 The Droid all must have! Accurate weathering, functional. Perfect mobility,built solid,built to last. Sideshow once again proved to be the best and at a great price. "it looks great next to the deluxe R2"
This is a very nice and accurate looking piece. really like the light up eyes. 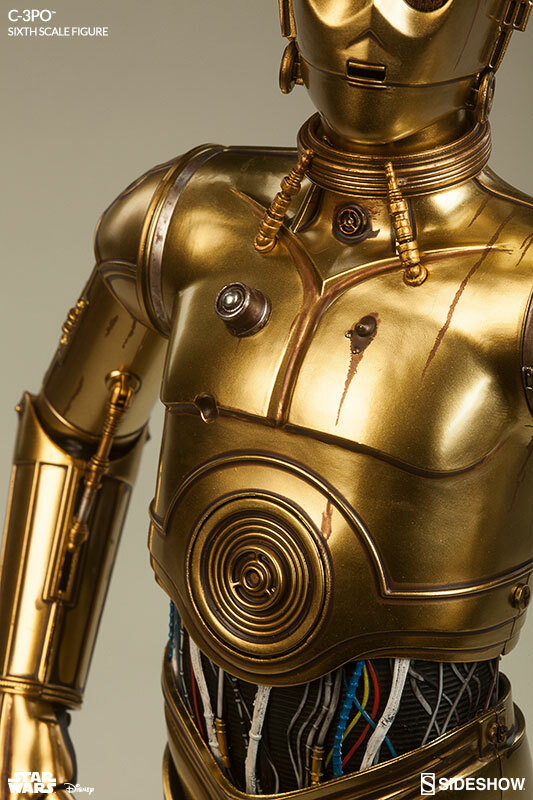 My biggest gripe is that the arm pistons are very fragile. He came with a broken piston on his left arm. Sideshow finally sent out a new arm . Looks great with Delexe R2-D2. 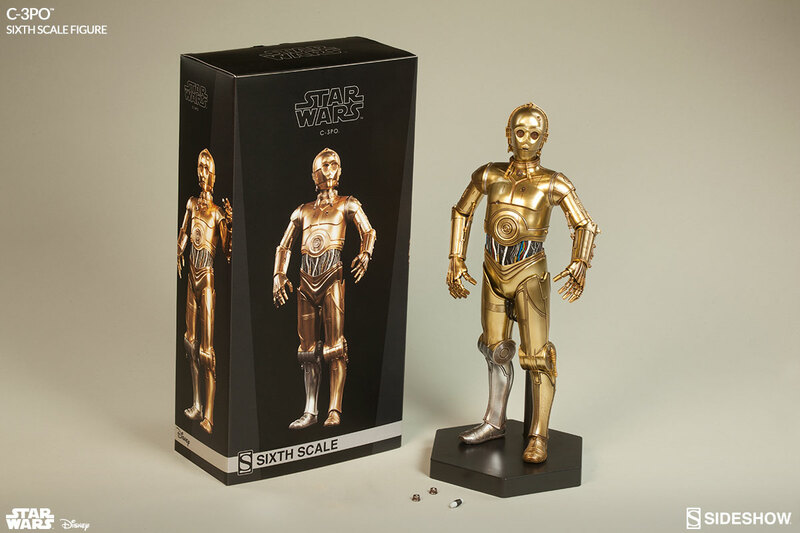 Accurate ANH weathering, functional pistons, and fine sculpt work. But Sideshow made it really collector-friendly with touch-sensitive LEDs (no switches), flexible materials for delicate parts, and solid articulation for hips, shoulders and fingers. Raises the bar and looks great with Sideshow's R2. After reading all the complaints I began to wonder if this figure was all what is was supposed to be. Good news the figure is awesome!!! I really love the weathering and all the details this figure has to offer. I will say the price is a bit steep at $230.00. Overall 8.5/10 great job Sideshow.